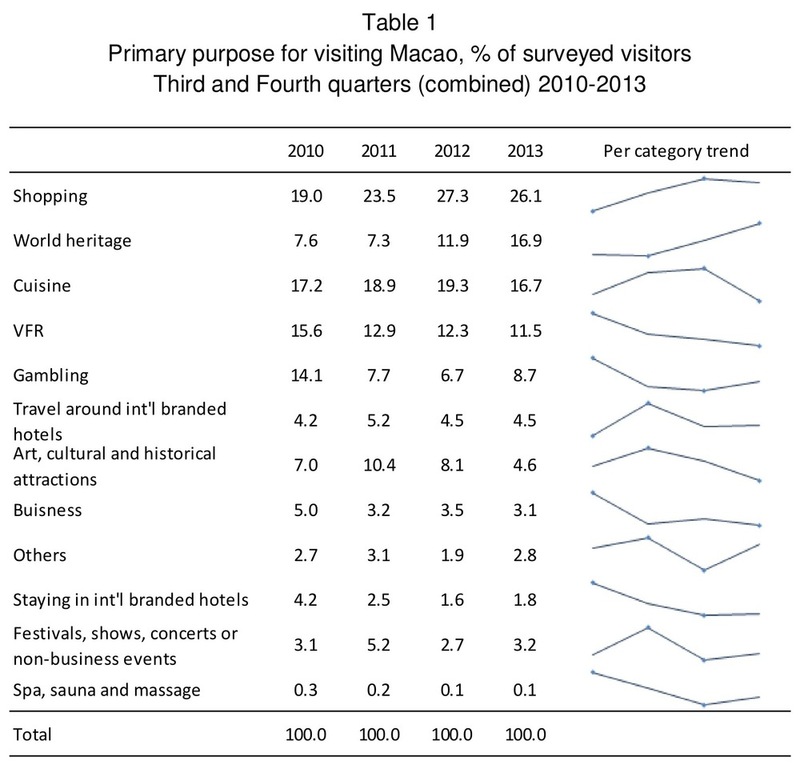 IFT Tourism Research Centre (ITRC) is releasing today the most updated results of its Macao Visitor Profile Survey (VPS) covering the third and fourth quarters of 2013. ITRC has been collecting quarterly data on visitor profile and characteristics and analyzing visitor trends to Macao since 2008. ITRC periodically monitors two particular trends considered to be important indicators of the long-term success of Macao’s tourism development. These are: (1) visitors’ primary purpose for visiting and (2) identifying determinants to lengthening the stay of visitors. Both indicators help gauge efforts toward diversifying Macao’s attractions and attracting longer staying visitors. In this dispatch, we also report the full year 2013 VPS for the seasonal difference in the two indicators. Table 1 shows the primary purpose of visit for the third and fourth quarters (combined) over the last four years. Shopping remains the major purpose of visit. Although the growth has slowed down in 2013, about 26.1% of those surveyed said they were drawn to visit Macao primarily for shopping. About 16.9% of visitors surveyed said they visit Macao primarily for world heritage. Despite the significant growth in the World Heritage as the primary purpose of visit, other attractions such as “art, cultural and heritage”, and “festival, show, concerts and other non-business” have shown a declining trend over time. Cuisine and visiting friends and relatives have been among the top draws for visitors and contribute steady shares of around 16.7% and 11.5% respectively. Finally, business as the main purpose of visit has declined over time to 3.1% in 2013. This suggests a need to attract business and MICE events to diversify tourism attractions beyond gambling and shopping. First time visitors are more likely to stay more than 2 days while compared to repeat visitors. Those travelling on package tour are more likely to stay more than 2 days while those travelling on individual basis tend to stay only one day. Visitors from Hong Kong are more likely to stay for 2 days, while those from Taiwan and other Asian countries are more likely to stay longer than 2 days. Mainland Chinese visitors are likely to leave on the same day of their arrival. 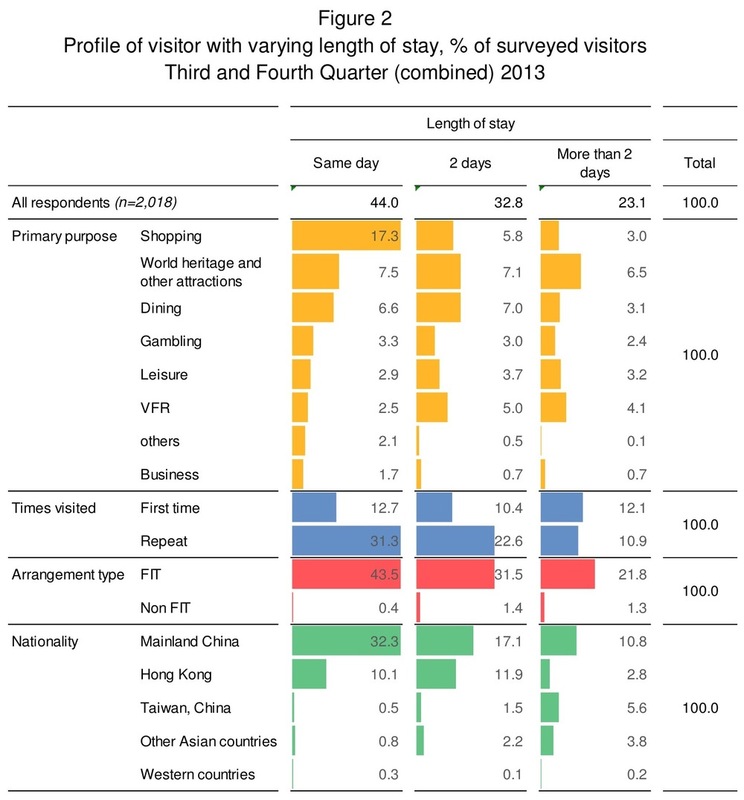 Visitors coming primarily for visiting friends and relatives, for leisure and for visiting World heritage attractions are more likely to stay longer than 2 days while those coming for cuisine tend to stay for 2 days. Visitors coming primarily for shopping are more likely to leave on the same day. Figure 3 below shows the monthly variation in primary purpose of visit. Among the major purposes of visit, shopping visitors do not seem to have significant preference in particular time of the year. Visitors coming for cuisine and heritage attractions tend to visit during the Golden week National Holiday in October while those visiting friends and relatives are more likely to come during Chinese New Year in February. Those visiting Macao for gambling and other leisure are more likely to visit in off-seasons in March compared to other time in the year. Interestingly, an obviously high proportion in festivals, shows and concerts was observed in November which suggests major attraction events, like the annual Grand Prix, can serve as a good strategy to draw visitors during non-peak seasons. In general, visitors do not stay longer in any particular month, neither during peak nor off-seasons. Figure 4 shows the length of stay by primary purpose of visit. Even controlling for the primary purpose of visit, there is no significant difference in length of stay over different seasons. ITRC monitors the profile of visitors to Macao for the purpose of informing industry and policy makers regarding the trends and long-term changes brought about by tourism development and to assess the effectiveness of marketing and promotion of Macao tourism. For information and queries, please contact Ms. Virginia Hong or Ms. Wendy Tang (itrc@ift.edu.mo). For PDF version of the release, please click here.